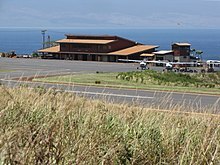 Kapalua Airport (IATA: JHM, ICAO: PHJH, FAA LID: JHM), also known as Kapalua–West Maui Airport, is a regional private use airport on the west side of the island of Maui in Hawaii. It is located five nautical miles (6 mi, 9 km) northwest of Lahaina, in Maui County. Most flights to Kapalua Airport originate from commuter airports on the other Hawaiian islands by commercial commuter services, unscheduled air taxis, and general aviation. As per Federal Aviation Administration records, the airport had 52,328 passenger boardings (enplanements) in calendar year 2008, 42,416 enplanements in 2009, and 40,060 in 2010. It is included in the Federal Aviation Administration (FAA) National Plan of Integrated Airport Systems for 2017–2021, in which it is categorized as a general aviation facility. Named for the Kapalua Resort a few miles to the north, the airport replaced the Kaanapali Airport, which had an even shorter runway, in 1987 to allow valuable coastal land to be developed. The airport code name JHM stands for John Henry Magoon, who was president of Hawaiian Airlines when that airline developed the airport. Hawaiian operated de Havilland Canada DHC-7 Dash 7 turboprop aircraft on flights to Honolulu. The STOL capable, four engine, 50-passenger Dash 7 was the largest aircraft ever to operate scheduled passenger flights from the airport. Hawaiian discontinued service to Kapalua when the Dash 7 was retired from its fleet in 1994. Mahalo Air, which operated between 1993 and 1997, also served Kapalua with flights to Honolulu using ATR 42 twin turboprop aircraft. Island Air discontinued service to Kapalua on May 31, 2013 when it replaced its fleet of Dash-8 with ATR-72 aircraft. On November 2, 2016, Hawaiian Airlines announced they would resume service at Kapalua Airport beginning January 18, 2017 with flights to Honolulu and Kahului. Flights were to be operated by Hawaiian Air's ʻOhana by Hawaiian subsidiary utilizing 48-seat ATR 42-500 twin turboprop aircraft. On November 15, 2016, Hawaiian Airlines announced that it was temporarily suspending sales of its Honolulu to West Maui service pending securing a TSA presence at Kapalua Airport. On January 11, 2017, Hawaiian Airlines announced they expect to resume service at Kapalua West Maui Airport by late March. On January 27, 2017, Hawaiian Airlines resumed selling tickets to and from Kapalua West Maui Airport, with service beginning March 1, 2017. Kapalua Airport is governed by a special agreement made by the state with Maui County. A former, privately owned airport, major changes or improvements to Kapalua Airport cannot be made without the consent of the Maui County Council. The county insists on limiting development to preserve the Kapalua community from commercialization. Kapalua Airport is restricted to a single runway, a couple of terminal facilities and support facilities. There are no air cargo facilities. Operations are restricted to daytime hours only. Passengers departing on 'Ohana Airlines will pass through TSA screening. Passengers departing on Mokulele Airlines are not screened by TSA. The United States Department Of Agriculture maintains an inspection station from 7:30 am to 1:45 pm. Passengers who's final destination is the U.S. mainland must have their checked bags inspected and tagged if they are checking their bags through to their final U.S. mainland destination. Passengers departing Kapalua Airport on flights departing after 1:45 pm will be unable to check their bags through to U.S. mainland destinations and will have to collect their checked bags at baggage claim in Honolulu, have them inspected by Honolulu U.S.D.A., check in at their Honolulu Airport airline's ticket counter, and pass through TSA security in Honolulu to continue on to their final U.S. mainland destination. Agricultural inspection is only required for bags departing Hawaii bound for the U.S. mainland. There is a snack bar offering a variety of light snacks, meals, and beverages. The airport covers an area of 50 acres (20 ha) at an elevation of 256 feet (78 m) above mean sea level. It has one runway designated 2/20 with an asphalt surface measuring 3,000 by 100 feet (914 x 30 m). For the 12-month period ending December 31, 2004, the airport had 9,990 aircraft operations, an average of 27 per day: 51% scheduled commercial and 49% air taxi. Makani Kai Air, Big Island Air, and Royal Pacific Air provide unscheduled, on-demand charter flights and tours. Kapalua Airport is part of a centralized state structure governing all of the airports and seaports of Hawaii. The official authority of Kapalua Airport is the Governor of Hawaii who appoints the Director of the Hawaii Department of Transportation who has jurisdiction over the Hawaii Airports Administrator. The Hawaii Airports Administrator oversees six governing bodies: Airports Operations Office, Airports Planning Office, Engineering Branch, Information Technology Office, Staff Services Office, Visitor Information Program Office. Collectively, the six bodies have authority over the four airport districts in Hawaii: Hawaiʻi Island District, Kauaʻi District, Maui District and the principal Oʻahu District. 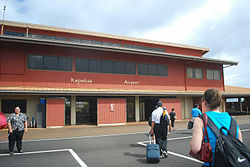 Kapalua Airport is a subordinate of the Maui District officials. ^ a b c FAA Airport Master Record for JHM (Form 5010 PDF). Federal Aviation Administration. Effective April 5, 2012. ^ "Enplanements for CY 2010" (PDF, 189 KB). Federal Aviation Administration. October 4, 2011. ^ Mark Vieth (July 1, 2010). "Pilots return to dedicate Kaanapali Airport monument". Lahaina News. Retrieved November 10, 2010. ^ "Hawaiian Airlines starts selling Kapalua tickets". Honolulu Star-Advertiser. 2016-11-03. Retrieved 2016-11-07. This page was last edited on 17 March 2019, at 15:57 (UTC).